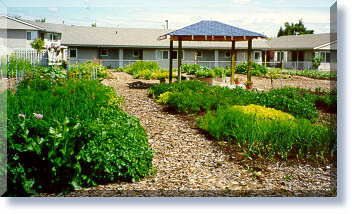 A Neighborhood Garden in Hillyard, Spokane. A definable geographic neighborhood. The domain of a child on a bicycle. A neighborhood is a distinct collection of dwellings, such as an apartment complex or building, or group of houses. Bus Stop. walkways. postal drop box. recycling dropoff. Daycare available in homes. Access to tools. meeting places / spaces / rooms. emergency response team. block home. No particular businesses here other than some home-based industry, teleworkers, salons, etc in individual dwellings. Possible cafe or intimate dining avaiable. Sleepy Hollow. Tortilla Flat. Send your favorite hood names to me. I'll compile.